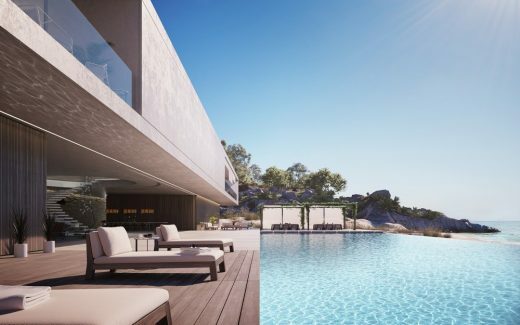 Concept Luxury Real Estate in Majorca, Spain – design by Superhouse Property Group Ltd.
Design: Superhouse Property Group Ltd.
Superhouse is a brand and an ethos – a vision for what is possible in contemporary residential architecture. 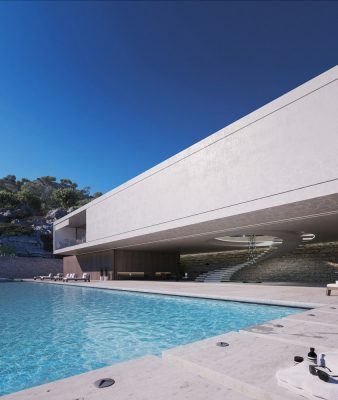 Superhouse want to create nothing but the 30 most exceptional houses in the world for the super-rich. 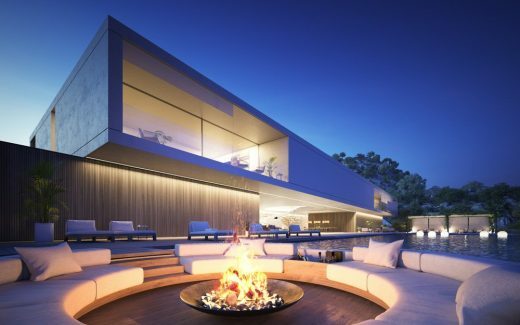 Superhouse’s mission is to design such houses, and focus solely on their creation without the distraction of other industry sectors. They will do so through having a holistic approach; not just to the design of a Superhouse, but also to the individual lifestyle out of which each house will be born. When a Superhouse is commissioned, the investment is not just in a design for a home, it is the design for this lifestyle. Superhouse don’t just provide the architecture, they provide the thought and process behind all the complimentary elements that go into delivering a completely unique Superhouse, anywhere in the World. 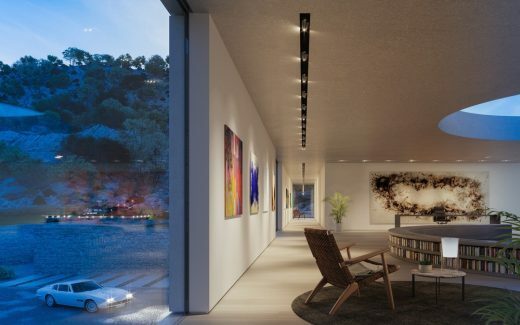 Superhouses are to be the most beautiful, unique and design-led houses possible, but for them all to be created through a very close working relationship with their owners. 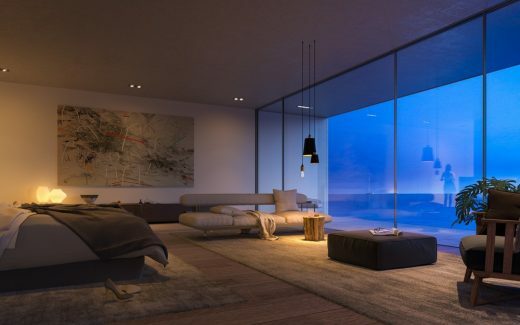 Superhouse want to design their dream home. There will only be 30 Superhouses in total – much like a limited edition series of art or watches. To emphasise this, each house will have its own number discretely engraved somewhere into the façade. 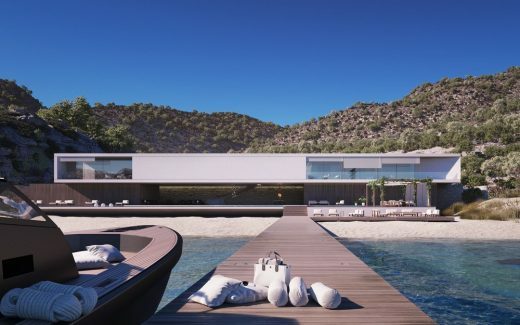 This Superhouse – S 00/30 is located in a private bay on an undisclosed Mediterranean island and is accessed down a long winding road through the mountainous landscape, or via helicopter for a quick transfer to the mainland. 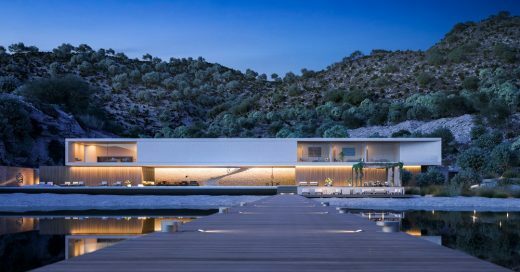 A walled entrance courtyard in local stone creates a sense of arrival – mirroring one’s presence in the sheltered, rocky bay whilst giving a view of the house against the open backdrop of the Mediterranean sea. 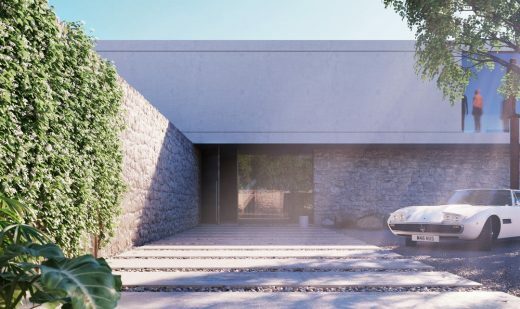 The design concept is very simple: two L-shaped stone walls cradle the house; within these enclosing walls there are two distinct timber volumes containing separate functions. The first contains service elements such as kitchen, stores, and staff accommodation. The kitchen and dining area are separated by sliding screens, which can sink into the floor to completely disappear and open up the two spaces. This enables a more open plan when the house is in “family mode”, but the kitchen can also be completely closed off when entertaining. The second volume contains a spa and gym. 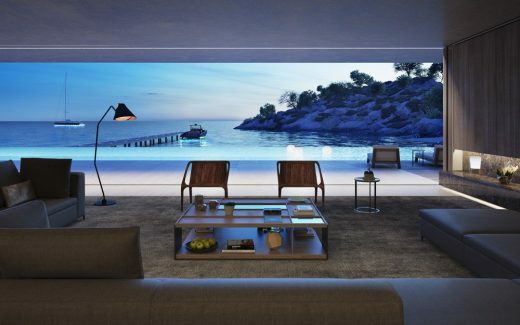 Again, sliding screens are used to allow the volume to open up and really connect the internal spa and gym spaces to the external areas. 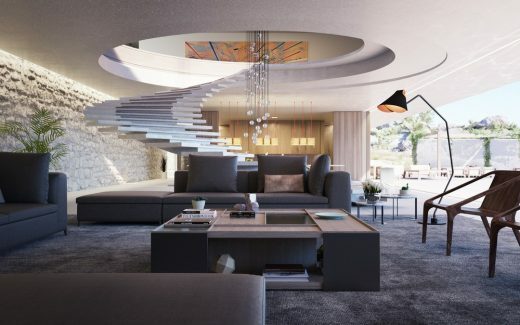 There is a staircase leading up to the master suite and four junior suites above, allowing the clients to descend directly for morning exercise and a swim in the 50m infinity pool. There is a private beach with a long dock to accommodate a yacht and tender. Website: Superhouse Property Group Ltd.